CAR REVIEW: Once upon a time, in a land known for sauerkraut, Schnitzel and cool beer, there was a small company called Volkswagen that made a little car for the masses. They made a lot of little cars actually, with little air-cooled engines and skinny tires and meager horsepower. But now they’re making bigger cars, with bigger liquid-cooled engines and fatter tires and real power. Yes, Volkswagen has come a long way since before World War II when all they made was the Beetle. Now, with a bevy of new cars, station wagons and SUVs, VW has got a foothold into the 21st century. 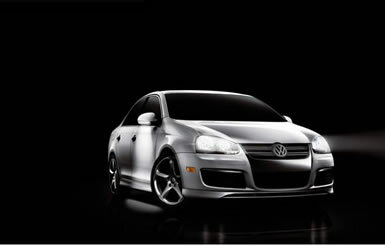 Enter the recently redesigned Jetta, a venerable model that seems to get only better with age. We got the opportunity to drive an S model with few options but lots of personality, as we usually get fully-loaded test cars, so it was nice to have a more basic model to drive. The look of the Jetta has morphed from a squarish, hunkered-down Euro-sedan to a more rounded, svelte and attractive world car, not easily pigeon-holed into European, Japanese or Korean styling. Lets just say it looks like a VW. And that’s a good thing. Enough said. That look includes an attractive front clip with jeweled headlights, a thick chrome strip dividing the grill, with chrome accents under the headlights, and a large VW emblem to top it all off. Move down the flowing fenders, into the large greenhouse, past the turn signal-embedded mirrors and feel the body grow in height until you reach the rear end with its stylized taillights with integrated reverse lamps and low liftover into the cavernous trunk, with which you can easily store enough bags for three or four people on a week-long trip. Jetta S comes standard with a 2.5-liter five-cylinder engine with 170 horsepower, and that’s up from 150 HP last year, and 177 lb.-ft. of torque that flows through either a five-speed manual gearbox that’s standard, or our tester’s six-speed automatic with Tiptronic and sport modes. With this engine expect 0 to 60 times in 8.5 seconds or so, according to VW. If your heart needs more power, then you can upgrade to the GLI model with a 2.0-liter turbocharged four-cylinder that puts out 200 horsepower and 207 lb.-ft- of torque. But those 30 extra horses come at a premium price of about $6000 over the as-tested cost of our S model. Added to that sweet five-cylinder engine is a set of McPherson struts and a stabilizer bar up front, plus a fully independent four-link rear suspension with another stabilizer bar at the rear. and it rides on 16-inch all-season tires. Now you’ve got yourself a great handling car, with a good ride and a high fun-to-drive quotient. Since we had to leave town for a few days, we didn’t get a chance to drive our usual test loop. We did, however, drive in some hilly terrain and never lost confidence in the Jetta on the unfamiliar roads; it went where pointed and never complained. Driving the Jetta around became more fun as the days passed with more familiarity of the controls and adhesion limits and figuring out when best to shift for ourselves or when to just let the computer do all the work. That transmission computer really got us going, too. We found we enjoyed driving in the sport mode through the hills, rather than shifting ourselves. There was a delay in shifting that most automanuals have, so letting the computer decide when to shift gears was more fun and really put to good use the available torque at any given moment. With more time behind the wheel, we probably would prefer the former but sometimes time is not on your side. And since gas prices are reaching ever higher, we were pleasantly surprised to get about 32 miles per gallon on an extended highway trip, especially considering the EPA ratings of 21 city and 29 highway. When was the last time you heard of an automotive journalist, or anyone for that matter, beating EPA estimates? We could boil it down to an inaccurate trip odometer reset, but the few miles difference wouldn’t amount to that much. Inside the Jetta is all business with its tidy gauge cluster, easy to use controls and comfy seats all around. As in years past, the speedo and tach gauges glow blue at night, but the handy driver information display stays red, as do that surrounding gauge lights. It’s a good look that’s easy on the eyes. We loved the versatility and ease of use getting a good seating position; it seemed that everything was adjustable, except for the pedals. The steering wheel tilts and telescopes, the seatback was motorized but the rest of it was manually adjustable. It didn’t take long for either driver to find a good perch and both were fatigue-free by the end of eight hours on the road. The Jetta begins at $16,990 with a whole big bunch of standard items, including power windows and locks and a nifty feature where you can roll up or down all four windows with the key in the driver’s door, electro-mechanical speed sensitive steering, split folding rear seats, eight-speaker AM/FM/CD stereo, as well as ABS, traction control (Anti-Slip Regulation in VW speak), Electronic Brake-pressure Distribution and TPMS (tire pressure monitoring). Add the Tiptronic six-speed automatic and you’re only talking another $1,075, for a grand total MSRP of only $18,065. For what you pay, you really get a whole lot of automobile here for a very reasonable price. Think of the VW Jetta as a pair of sensible shoes that you can take out for a comfortable jog on a nice sunny day.